The NABSD Uniform Department is focused on ensuring Midshipmen are properly outfitted with uniforms for their 4-year training period and beyond. From Day-1 (Induction Day, or “I-Day”), the incoming Plebe class are immediately fitted with the white works uniform so they can be sworn into the Navy later that day. The swearing in ceremony is attended by thousands, and numerous members of the press and media corps are on hand to cover this significant milestone. The Uniform Department dedicates months in preparing for this event and the days that follow. Over Plebe summer, newly reporting midshipmen are issued uniforms and various accessories valued at $3300. Once the summer training is complete, Midshipmen receive the remainder of their uniforms just prior to the commencement of the academic year, and prior to seasonal changes. The Uniform Department also operates a retail store, sales directed at Midshipmen, Enlisted and Officers assigned to the Naval Academy. 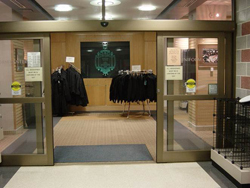 The Uniform Store and Dress Uniform Issue Center also serves Alumni and retired Naval Academy Graduates. The Uniform Department takes great pride in servicing the Midshipmen and Officers. We appreciate the opportunity to be a part of a great institution. 07:30 a.m. – 4:00 p.m.